Share your photos on Instagram with the hashtags #fieldtripraglan and #oliverands. After successfully sewing this pattern, you will have developed the following skills: knit fabric and raglan sleeves. 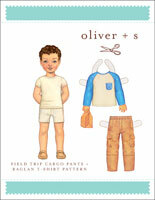 Very easy pattern that sews together quickly and looks great. I love doing the body and sleeves different colours. My son wanted to dress as a Martian for dress-like-a-book-character day in school. He needed a white-and-yellow shirt, which we couldn't find anywhere in the stores. So, instead, I made him one from the raglan T-shirt pattern. Joining all the fabric strips was a bit labor intensive, but the results are awesome. The pattern is really easy to work with and fits great. The only thing I'll adjust a little bit next time will be the neck opening. My son complained that he wanted a more distinct difference in how the front is lower than the back. 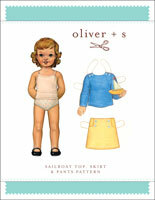 I like that this pattern has instructions on how to make it with both a serger or with a sewing machine. I wish more patterns would do that. I ended up serging most of the seams and then top-stitching with what my machine calls a honeycomb smocking stitch. Looks pretty, results in a flat seam, is sufficiently stretchy, and doesn't unravel if you have to cut into it. It is a good pattern. So very easy and quick to put together. 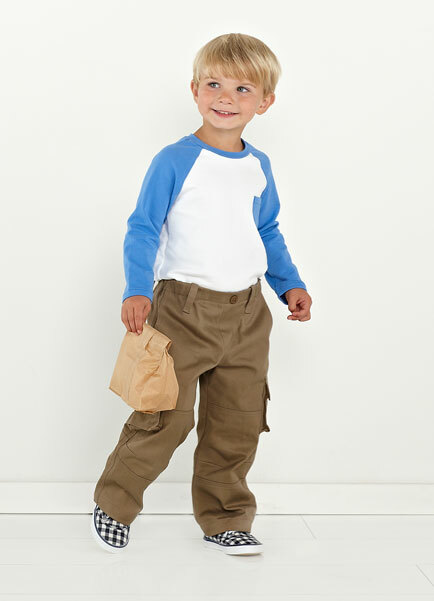 I love raglan sleeves, so easy to sew and looks cute on kids. It took me 2 hours to finish the project---including printing and taping the pattern. I am satisfied with the result. The fit is a little bit on boxy side for a girl, I cut size 6 width and size 8 length for my daughter who is almost 8, and wears size 7. It looks good but the shirt definitely has some room to grow. 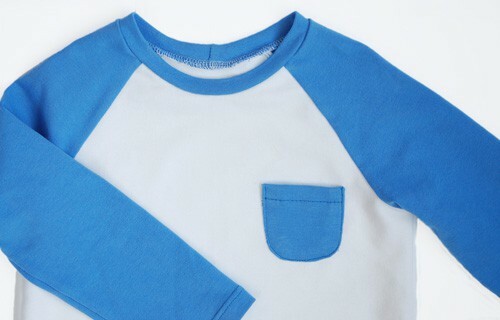 This basic long-sleeved tee was a quick and easy sew. I love the ease of sewing together raglan sleeved garments for myself, and am glad to see this practical basic for kids. Offering this as a single pattern download is perfect ... the shirt was all I needed. Next time, I'll cut out a few, and just sew my way through the stack! I've had so much fun making shirts for my kids using this pattern!!! To make it even faster I've been hemming the sleeves before assembling the shirt. i love this pattern! I made this in the smallest size and this is was a joy to make. Straightforward instructions and quick to finish. I'll definitely be making more. I have sewn up probably half a dozen of these for my son already and I adore this pattern. It's very quick on my serger and turns out very polished. My only warning is that if you're using a knit that doesn't stretch all that much, cut your neck binding a little larger so it doesn't pull. Other than that - smooth sailing! I had two new grand babes on the way and I couldn't wait to make some cute new things for their wardrobes. Everything was perfect! I highly recommend this pattern and I know I'll be back for others. This pattern has gotten the most frequent use of any that I own. It fits and looks great as a t-shirt, but is easily adaptable for other uses. It works great to make a rash guard out of swimsuit material. I have made it this way with a zip front and as a pullover. The a-line tutorial on the blog was used as the basis for a Princess Leia Halloween costume. This pattern has been produced excellent results every time. This pattern is brilliant. I consider myself a very inexperienced sewer, having only made a handful of things from free patterns on line. 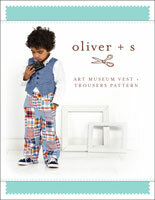 I was desperate to make some trousers for my little boy like daddy's and this pattern looked perfect. I was unsure about buying it though as the finished product looked rather complicated and thought it may be beyond me. However, the pattern is so brilliantly written that it takes you through step by tiny step, until out the other end comes a really cool and cute pair of trousers. I added an embroidered tractor to one pocket for my tractor mad boy. https://www.flickr.com/photos/47792434@N07/14310333138?initial-comments-show=5#comments I can see myself using this pattern again and again and will definately be buying more. Thank you for such a fun sew. This nicest fitting t-shirt I have ever made! Since I have made my older girls several of these tee's they turn their noses up at any other pattern. It is just a lovely fitting tee. It sews together nicely and has good length arms and body. A few girls have found the neckband a bit loose (I have not) but if you follow the rule of cutting the neckband 2/3 rd's the length of the neck you should be fine! I have only made plain ones but I LOVE the look of matching the neck band to the sleeves. I am so pleased it is available as a single, great for those who may not make the trousers. Don't be put off by the PDF. Oliver+s ROCK at PDF's. 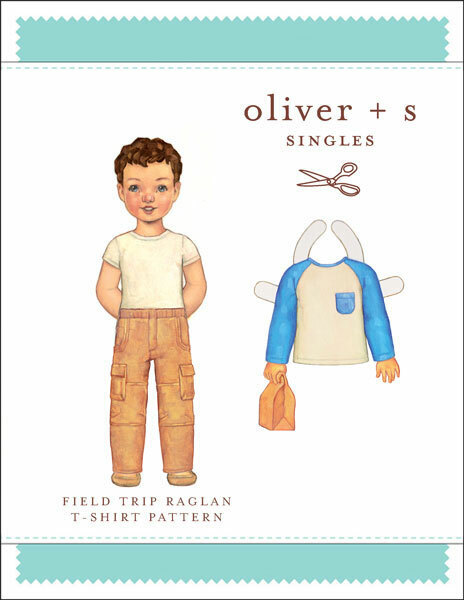 Discussion on the digital field trip raglan t-shirt sewing pattern from the Oliver + S Discussion Forums. Find and share more photos on Instagram using the hashtags #fieldtripraglan and #oliverands.